"I remember the first time I heard about Sonlight from another homeschool mom," writes Katie M of Des Moines, IA. "She was a seasoned homeschooler; I was just dipping my toes in. Now, here we are 12 years (and three more children) later, and I'm so grateful to that mom. My children LOVE Sonlight (so do I)! Each spring when I begin my search for next year's curriculum, the first choice my children shout out is 'Sonlight!' They love the stories and the way that Sonlight brings history to life for us. "The time we spend each day reading together and discussing important historical and biblical facts has become their favorite time of day. Even now, my teenagers sit down in the living room with their younger siblings and ask me to please read history to them. "I can teach three of my kids with one History/ Bible/Lit program by simply adjusting their own level of math, science and grammar, which Sonlight has already figured out for us. It has saved me endless hours of lesson planning. I love having the schedule laid out for me each day. This has left so much more time for me to build lasting bonds and precious relationships with my sweet children. I know that when the last of my five children graduate from homeschool high school, they will remember learning the Sonlight way with the greatest joy. In this photo (taken by her older sister Megan), Mary Kate (5) enjoys reading a book from Sonlight K.
We just wanted to let you know that WE LOVE SONLIGHT! Last year Thanksgiving and Christmas couldn't come fast enough so we could take a break from the drudgery. But this year, our first year with Sonlight: Not so! We are having too much fun! We are definitely hooked on Sonlight! One of the key goals of Sonlight is to help raise children who will love to learn, children who will have a natural curiosity about the world in which they live, and initiative to explore and learn about what interests them. To that end, we've created curriculum packages that will at once both teach and inspire: programs that will cover a lot of academic ground but that will also be fun along the way. Purchase a All-Subjects Package or History / Bible / Literature Package (see the Key at the bottom of this page) and you'll automatically receive SonlightCares. Your perks include a 10% discount on all other purchases you make from Sonlight for the year. It doesn't matter how large or small your orders are... as long as it's in the same 12-month time frame, you'll receive 10% off every purchase you make. Combine your perks with FREE domestic (or drastically discounted international) shipping on your first order, and you'll save 20% or more on your homeschool curriculum purchase. Many potential customers have told us they think they can get a better deal somewhere else. They price shop every single item and buy five items from one vendor, two from another, ten items somewhere else, and so on. Weeks, months, or years later they come back and tell us they wish they had simply purchased from Sonlight in the beginning. Because after they have done all the work, they find they have spent more money than they would have if they had bought directly from Sonlight. Why? Because they ignored the 10% discount. They forgot to calculate how much the multiple shipping and handling charges would add to their total purchase price. And, worst of all, they forgot just how much time they would lose trying to save a few pennies. Here's what Joanne in Texas had to say about her experience. After hours and hours of research and many emails, I finally realized that it doesn't pay to try to organize my own Sonlight package.... Between the time, effort, shipping, and stress, the savings, if any (and that's questionable), are minimal. I've decided I'm ordering straight from the source! I looked into Sonlight before my first year of homeschooling and thought it was way too pricey. If I remember right, it was going to be a little over $500 for what I needed that year. So I used several different curricula from many sources that year... trying different approaches, switching when something wasn't a good fit for us. That next summer, I added up what I had spent that year (for one child) and it was over $700... and I had almost NOTHING to show for it! I didn't have a bookshelf full of books that could be reused. I had lots of workbooks that had been written in and couldn't be resold. That was when I decided to give Sonlight a shot. I figured even if we tried it for a year and decided we didn't like it, we weren't going to be out any more money than we would have been with any other choice. By the way, we loved it... and we're going into our third year of using Sonlight. I currently own about 10 of the books I'll be using next year. So, playing around Sonlight's website, I first loaded my cart with everything I'll need, including the History / Bible / Literature program. Cost was $504. Emptied my cart. Then, I thought I'd see if I could save money by leaving off the 10 items I already have. Entered all those codes and looked at my cart. Cost would be $511. Surprising. When you buy a homeschool curriculum program, you won't have to spend any of your precious time hunting through used book sales or libraries trying to locate books! I like being able to just order it all and have it appear on my doorstep. I've got children to teach and a home to run efficiently. I don't have TIME to 'shop.' Thanks, Sonlight, for making my job easier! I can't tell you how many parents have told us they started out trying to use the library but then gave up. Why? Because the books they needed were not a part of the library's collection or, if they were, they were never available for checkout when needed. Then again, parents who are able to get the books they need from their library often find they are different editions than the ones Sonlight sells. And so they must deal with books whose page numbers don't match the page numbers referenced in their Instructor's Guides. The Instructor's Guide says to read page 37, but in their edition, it's page 42: a relatively small frustration when it happens once, but far larger when it's repeated day after day. And you can get rid of it for an entire year! Similarly — something more and more of our clients are running into — high school students find, when they don't have their own personal copy of the book to mark up, it's tough to do the required literary analysis that is an integral part of an upper-level high school course. Whatever their reasons: a lot of customers find they are frustrated when they buy only partial programs, but discover their frustrations are relieved when they purchase "the whole thing." That's right. 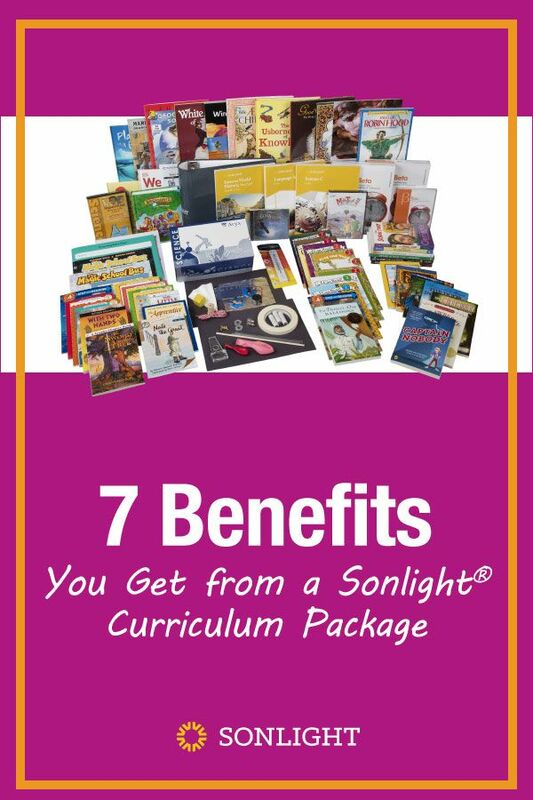 When you purchase any All-Subjects Package or History / Bible / Literature Package, you get to take advantage of Sonlight's exclusive Love to Learn Guarantee. And that means you can buy — and use — any All-Subjects Package or History / Bible / Literature program without risking a penny more than the cost of return shipping. Where else can you find that kind of guarantee? What's more you can create your own complete program by combining any History / Bible / Literature with any Math and Science programs (one each per package), plus the coordinating Required Resources you need, on one order and you're still covered! Use all of it for 18 weeks. If you are not convinced it makes homeschooling a pleasure for you and your kids, please return it — the entire package, used books and all. We will give you a full refund of everything you paid us. This unique Love to Learn Guarantee is something we offer only with our All-Subjects Package and History / Bible / Literature programs. You won't get that kind of guarantee if you purchase individual titles. In a typical curriculum package, you'll find books from a variety of literary genres and a range of reading difficulties. You and your child will certainly enjoy most of the books you read. But it cannot be "all pleasure, all the time." Sometimes education requires discipline and hard work. Therefore, we include a few titles in every package that will force your child to concentrate extra hard. On the whole, however, we believe you and your child will be exceedingly pleased with the content and book choices you'll find in our curriculum packages — despite the one or two you may not like as well — because all of the books are intended to work together to strengthen your child's reading skills and increase his or her desire to read and learn. The individual scholarships we award each year include one $20,000 scholarship ($5000 per year for four years), four $10,000 scholarships ($2500 per year for four years), and eight $4000 scholarships ($1000 per year for four years). If you haven't purchased at least five complete curriculum packages (All-Subjects or History / Bible / Literature), your children cannot compete for these scholarships. Go to our scholarship page for more information about submission deadlines and requirements. Because we believe it will ultimately make you happier... which makes us happy. Let me put it plainly. Who would you rather work with: unhappy clients, moderately happy clients, or thrilled clients? I know who I would rather work with! Thrilled clients. And who are our most passionately happy clients? It's the people who purchase our homeschool curriculum packages.